Some of you have been asking me to post my haircare routine and tips for taking care of your hair (especially in these harsh winter months). 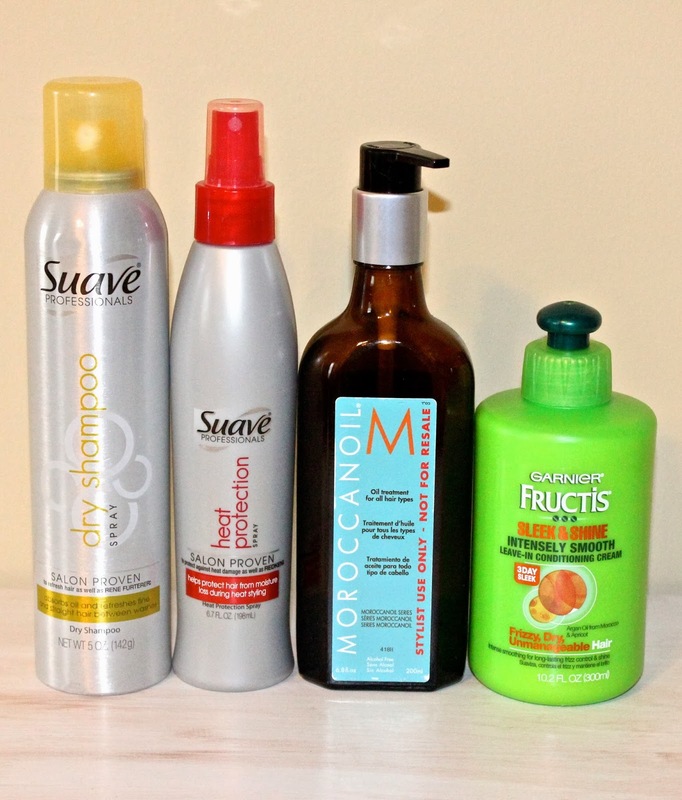 Here are some products I use to protect my hair and keep it healthy! Suave's Dry Shampoo: Washing my hair everyday really tends to dry it out. Because of this dry shampoo I CAN go without washing it everyday. This stuff is amazing! Just spray it on the roots, let it sit a couple minutes, then brush it out. It absorbs the oil so well and looks like you just washed your hair! I also use this the same way, but as a volumizer on my freshly washed and dried hair. Suave's Heat Protection Spray: I use this spray before blow drying my hair and also before using any type of hot tools. It's so important to use a heat protectant before applying heat to your hair! It's made such a difference in my hair and has helped keep it healthy. Moroccanoil: I love this stuff. I use it every time I wash my hair by applying a small amount to my wet hair when I get out of the shower. Sometimes I add a little more once my hair is dry just for some extra shine and to make it a little smoother. -This product can be pricey, but my husband got it for me for my birthday about two years ago and I still haven't run out! Garnier Fructis - Sleek & Shine: This is such a great leave-in conditioner! Leave-in conditioners are really important in helping keep the hair from becoming dry or frizzy. I apply this to my hair once it's been washed and dried. Blowdrying tips: It's best to dry your hair on the coolest setting, but sometimes we're in a hurry and need the warmer setting to rush the drying process. I never use the hottest setting because that can be too hard on your hair, but sometimes I use the medium setting (always spray heat protect before using a warmer setting) and when my hair is about halfway dry I switch over to the cool setting to seal the hair cuticle, protect against overheating, and add shine. Tips with wet hair: Your hair is most fragile when it's wet, so it's important to be as gentle as you can when it's in this state. Make sure your hair is tangle free before brushing it. If you have tangles, use your fingers to get them out instead of a brush. Brushing out tangles while your hair is wet can stretch the hair and it may not be able to return to its normal length once it's dry, causing it to easily break at weaker points along the length. *Last week I posted about the vitamin, "Biotin", which I also take daily for healthy hair! Thank you so much for your beauty Tips.